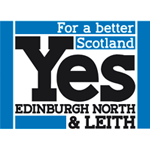 Yes Edinburgh North and Leith (YENL) is a community based group that campaigned for a Yes vote in the Independence Referendum. With the result of the referendum being a No YENL is currently considering it's future campaign plans and we hope to present our new plans shortly. Below is a list of some of the groups and parties that were involved with us in the campaign.